We’ve all had red velvet cake. 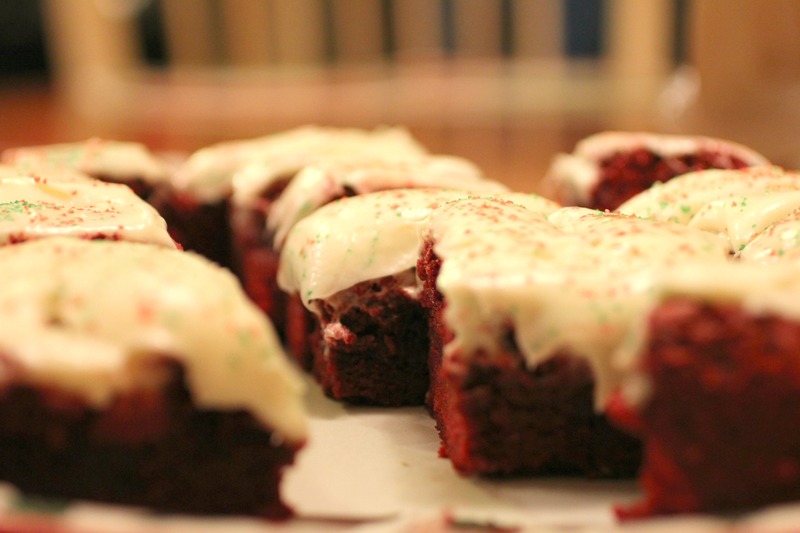 Especially around this time of year, red velvet cake makes an appearance at almost every holiday party. Now I love some red velvet cake, but I wanted to do something a little (but not a lot) different. 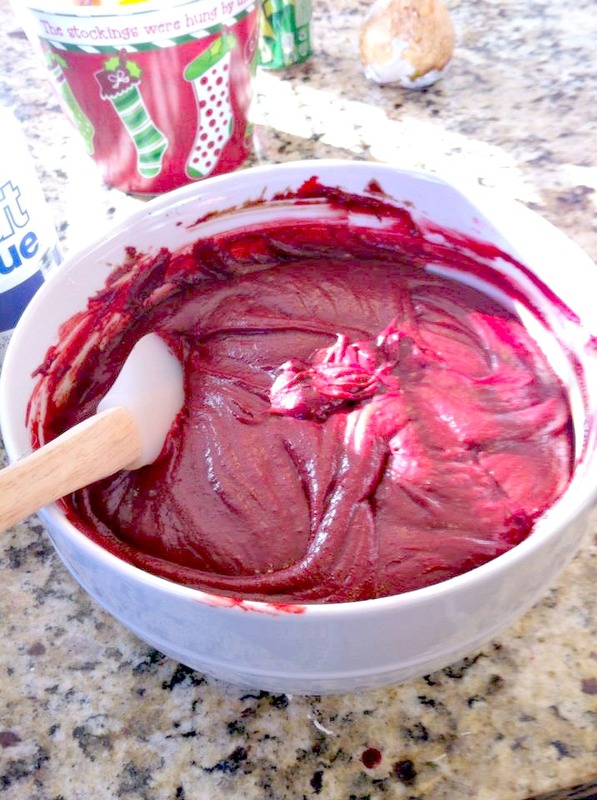 I love how the red velvet looks so festive and matches all the Christmas colors. But I didn’t want to do the same ol’ cake. So BAM! 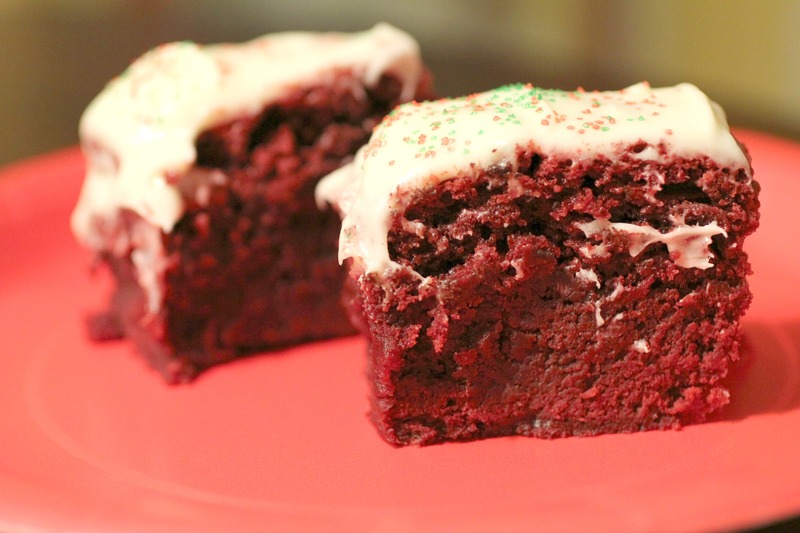 These red velvet brownies fit the bill. 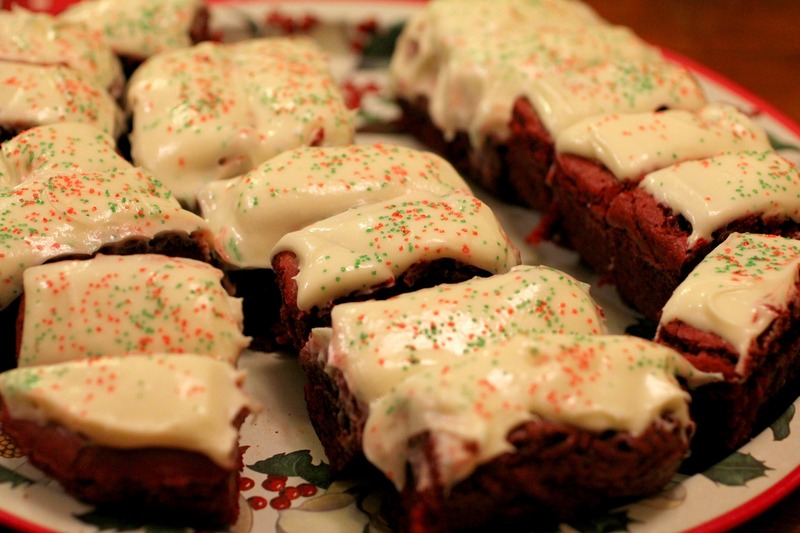 They’re still red and festive looking, but they’re brownies instead of cake! These things are SO RICH. They’re very dense and moist and oh-so-delicious! We LOVED these, and they were a big hit at our family Christmas party! Oh, and another bonus: I made these using only one bowl! Hooray for less dishes to wash! As you can see, these brownies are a lot thicker than your typical ones. So we cut ours pretty narrow just to ensure that we had enough to go around. And besides, they’re so rich, you don’t really need a big one! If you want yours to be thinner, like the height of regular brownies, you could use a bigger baking dish to spread out the dough. Plus, that would increase the number of brownies you could serve as well! I know the next time I make these, I’ll be using a bigger dish (or splitting the batter between two dishes) to make these a little thinner and make more individual servings. I would definitely recommend that you take these to your next Christmas party! Bake at 350° for 45 to 50 minutes or until a wooden pick inserted in center comes out with a few moist crumbs. Cool completely. While brownies are cooling, make the frosting. Beat cream cheese and butter at medium speed with an electric mixer until creamy. Gradually add powdered sugar and salt, beating until blended. Stir in vanilla. I wish you a Happy Holiday!! These look good! Red velvet anything is my son’s favorite, so I’ll have to add these to the “to do” list =).